ATLANTA, GA – KANSAS is excited to announce keyboardist Tom Brislin as the newest member of the band. Brislin replaces departing keyboardist David Manion. An internationally acclaimed musician, Brislin has performed and toured with a variety of artists, including Yes (appearing on Symphonic Live), Meat Loaf, Debbie Harry of Blondie, Camel, Renaissance, Dennis DeYoung formerly of Styx, and many others. For years he fronted the band Spiraling and produced his debut solo album Hurry Up and Smell the Roses. Most recently, Tom co-founded the progressive rock group The Sea Within. Along with guitarist Roine Stolt of The Flower Kings, bassist Jonas Reingold of the Steve Hackett band, and drum star Marco Minnemann, they released their first album in 2018 on Sony/Inside Out Music, joining KANSAS on the label’s roster. Tom has also formed Gold Rotation, a collective of diverse musicians and songwriters who premiered with a performance at Progstock Festival in 2018. Brislin’s first performances with KANSAS will be aboard the Rock Legends Cruise in February, followed by March 1 in Baltimore, MD at the Modell Lyric where the band will be resuming the Point of Know Return Anniversary Tour. 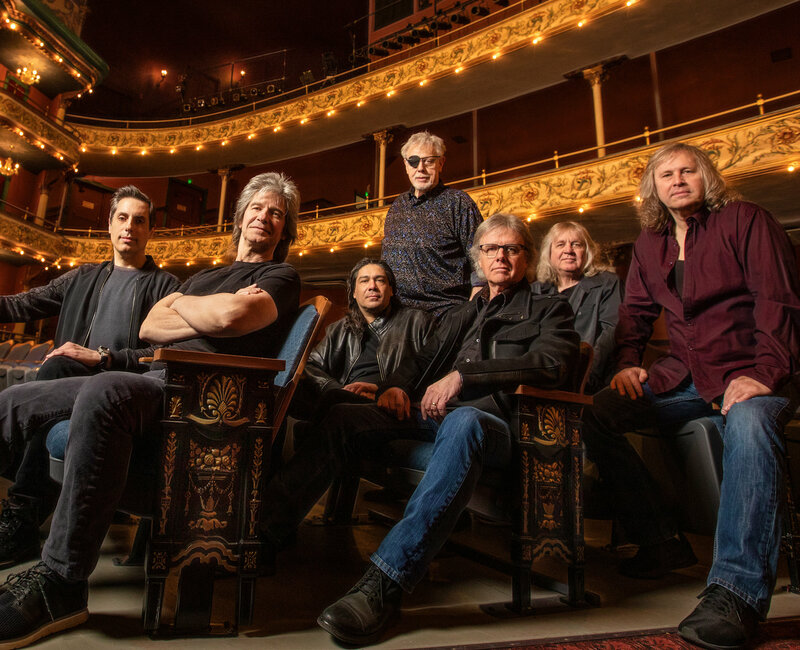 The band will perform a set of KANSAS Classics at shows throughout the summer, before returning to the studio to begin a new KANSAS album in August 2019. Tom Timely’s “The Elf King”–a Prog Masterpiece? Just a smidgeon of confidence! Tom Timely has written, produced, and released a single under the title, “The Elf King.” Unfortunately, at the moment, it seems only to be available as a Facebook video. Here’s hoping Timely will move it to Youtube. Somewhat astoundingly, Timely begins his video with “Introducing A Prog-Rock Masterpiece,” all in Tolkienian, Elven script. My new song! Remind yourself of an earlier time over and over…until it becomes your reality. Think of the things you could do if you had the key to unlock the past….You could change things! Some call it nostalgia, I call it the key. Check out my song and see if it takes you back. So, kudos to Mr. Timely for possessing so much confidence. His pronouncement of “introducing” a “classic” reminds me of the founding father Benjamin Franklin when he wrote, rather proudly, that he possessed the virtue of humility. Some things, simply put, cannot be bestowed on one’s self. Anyway, I’ll just take this as Mr. Timely’s enthusiasm. The single, “The Elf King,” is quite excellent, introducing us to some very Yes-ish bass, combined with Kansas and Genesis-like keyboards throughout much of the song, though harpsicord is the first instrument the listener hears. I can’t quite place the voice, but Timely (I’m assuming it’s Timely on vocals) has a Styx-like feel to me. While the entire middle and sections sound very reminiscent of Tony Banks’s work on Gabriel-era Genesis, the song itself seems to have been a long, forgotten part of Leftoverature. Since I’ve referenced Yes, Genesis, Kansas, and Styx, you might very well get the opinion that this is pure nostalgia prog. Heck, even Timely himself admits the element of nostalgia. Yet, this song is definitely more than a sum of its parts, and no one of the bands mentioned above could’ve written this song as is. Thus, there’s a real genius in the way Timely pulls all of this older pieces together into a new whole. I have a feeling Timely might very well have introduced a masterpiece. What say you??? Here we are again, folks. We find ourselves at the end of another great year for prog. Sadly, we’ve had to say goodbye to some amazing artists this year, including John Wetton, but we at least have their music by which to remember them. I know I’ve been a bit quiet here at Progarchy lately due to beginning graduate school this fall. Hopefully things settle down going forward, and I’ll be able to contribute more. For now, here are my favorite albums from 2017 in vaguely ascending order. • “Secrets” by Ian Fletcher Thornley | I was initially flummoxed by this album, expecting a variation on the hard-rocking, high energy music of Big Wreck and Thornley, both fronted, of course, by the prolific Canadian singer, guitarist, writer, and producer. I finally listened to it late one night, in the dark, and I finally heard it on its own terms: acoustic, reflective, mellow, mournful, defiant, sad, and yet shot through with a sense of cautious hope. Thornley demonstrates that his remarkable writing skills are equal to his vocal prowess, which is an aural wine bearing hints of Big Country (“Frozen Pond”), Chris Cornell (“Feel”), Peter Gabriel (“Stay”), Bruce Springsteen (“Just To Know I Can”), and Jeff Buckley (“Blown Wide Open”). In the end, this is a modern blues record featuring every shade and hue of sadness, longing, and loss. The title of the new Kansas album—“The Prelude Implicit”—is open to some interpretation, but the intent of the cover art, which features a phoenix, seems clear enough: regeneration and rebirth. The legendary band has long been known for non-stop touring, but the past few years have seen the sort of changes that either mark the end or a new beginning (and that is, I suppose, the likely implicit message of the album’s title). Like many other groups that achieved great commercial success in the 1970s, Kansas has gone through several line-ups, as I cover in some detail in this 2013 review of a John Elefante album. some bands are far more interesting for what they did off the stage than for what they did on the stage. And then there are bands that really are, at the end of the day, all about the music, and it seems quite clear that Kansas is in the latter camp. It is rather striking how ordinary these six musicians appear to be, with only Walsh (who retired last year) giving occasional glimpses into a more prickly, difficult side. Ehart, whose warm humor and casual self-deprecating approach make him the star of the documentary, is keen to praise his bandmates, expressing obvious awe over Walsh’s vocal prowess and Livgren’s songwriting, saying that back in the day he didn’t think of Livgren as a musical genius, but perhaps only because they ate hamburgers together. And even Livgren, who nearly died in 2009 after suffering a stroke, seems genuinely surprised at the astounding run of classic songs he produced in those years, offering up thanks to God in a somewhat “Ah, shucks” sort of way.